Basement System's DryTrak system works perfectly for monolithic floors. It is designed to relieve water from the wall-floor joints. The water caught in the DryTrak system transports the captured water straight to the sump pump. This home's old sump pump failed and it was time for a replacement. The sump pump had always been a problem and this homeowner did not want to worry about the new pump during any condition. The TripleSafe has three pumps that activate depending on the amount collected and includes a battery backup in case of power outages. WaterGuard drainage channel has a patented profile that includes a wall flange with spacers for collecting wall seepage, channel holes that allow ground water to enter the drain line, and a large-diameter channel that can’t crush or kink like standard plastic drain tile can. This innovative interior French drain system, and all of our patented basement drainage systems, are designed to work with the powerful, reliable sump pump systems from Basement Systems. Water leakage in basement near south wall cove joint. Bowing of basement support pole and crawl space adjacent to basement insulation. I recently moved into this home. The pre-sale inspector found some cracks in the foundation. I had them further checked out by a structural engineer and, while he said they weren't a significant issue, he advised having them repaired to prevent further problems. I'm also interested in having an egress window installed in the bedroom. Thanks! The floors, walls, and ceiling are cracking/bowing/sagging & am quite worried. We have 2 slabs of concrete in our driveway that have sunk and we would like to have an estimate on lifting the two slabs.. Our driveway is on a hill. I have a concrete panel of my driveway (approx. 6x6) that is sinking and in need of leveling before winter. I would like to obtain an estimate as soon as possible. I think we have some cracks in our foundation, because we have some water damage in the basement. The apron in front of one of my garage doors has sunk a couple inches, between the garage exit and the driveway. My garage floor (concrete) cracked and dropped, due to vibration of heavy equipment operating nearby. I am interested in a free appraisal and cost estimate for the repair. Thank you. Foreman did a fine job of leading his crew. Tim Doyle and Ty Azevedo did a great job of explaining and installing. We felt that they were honest and stood by their product and did not do a hard sell. They were patient in explaining and considering the home owners. By Teresa & Rick B. "I compliment your excellent product, give Terry a raise!..." By Ed & Carole T.
"Tim Doyle and Ty Azevedo did a great job of explaining and..."
For more than 35+ years, Ayers Basement Systems has been Traverse City's trusted contractor for basement, crawl space, & foundation solutions. As a local Michigan business, Ayers Basement Systems is proud of the friends, neighbors and customers we've helped in Traverse City. We stand behind our work and customer service, providing extensive warranties and 100% customer satisfaction. Working with hundreds of businesses and homeowners we have successfully provided foundation repair, concrete leveling, basement waterproofing, and crawl space repair. For quality foundation, crawl space and basement waterproofing repairs in Traverse City Ayers Basement Systems can help. We have the experience, products and personnel needed for permanent repair work. Call us today at 1-844-262-2971 to start your free, no-obligation home inspection and cost estimate. If there is water or moisture in your basement or crawl space, you will eventually have mold and rot. The good news is we can prevent mold and rot from developing with proper basement waterproofing and crawl space encapsulation. Our work comes with a lifetime, transferable, dry-basement warranty. Ayers Basement Systems uses a proprietary, patented basement waterproofing system to keep you Traverse City home dry. We first install a hidden drainage channel along the inner perimeter of your basement. Any water entering the space is quickly collected into the drainage channel (before any damage can happen). The water is channeled to a hidden sump pump which pushes the water out of your home and away from the foundation. The entire system is 'invisible'. You don't see it working, you only see the results - a dry basement. The finishing touch is a specially designed, energy-efficient basement dehumidifier which removes excess water vapor. This prevents mold growth when used properly. We can also protect your crawl space using a similar waterproofing system. The entire crawl space is covered with a thick, vinyl vapor barrier which lays on top of a insulating matting placed on the floor. The crawl space vents are sealed off and a sump pump and dehumidifier are installed. The crawl space entrance has a sealable door installed. The completed system removes any entering water and keeps the relative humidity of the space low enough to prevent mold growth and rot. No wet crawl spaces. No mold or rot. No uncomfortable, cold floors over the crawl space. Foundation issues can quickly destroy the value of your home if left unfixed. We have repaired and restored the foundations for hundreds of homes throughout Michigan & Indiana including Traverse City. We have a number of different tools to ensure we have the right solution for the exact foundation problem your home is facing. 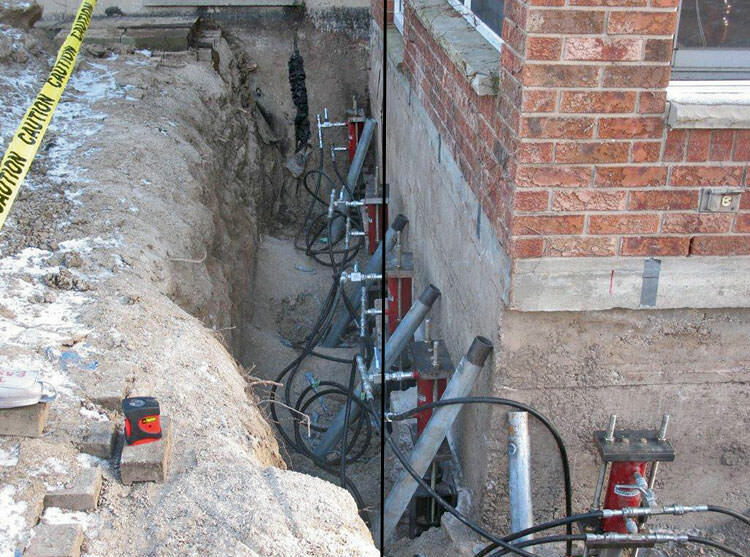 If your home's foundation is settling we can fix it using foundation piers. Depending on the underlying cause of the settlement we use push piers, helical piers, slab piers or helical deck piers. For bowing basement walls we can use wall anchors, wall stabilization systems or sprayed concrete. We even correct sagging floors over crawl space by installing support jacks. Whatever foundation problem you have, Ayers Basement Systems can fix it. Uneven cement and concrete in Traverse City can be a tripping hazard and unsightly scene you don't want around your home. Ayers Basement Systems offers our Traverse City customers concrete lifting and leveling services. We use the PolyLevel product which is a foam added to a slurry which literally lifts the concrete back into place. It's an alternative to mud jacking and PolyLevel only takes minutes to set and is non-invasive to your home and schedule. It quickly levels the concrete and gets you back to your home and life. Contact us to set up a FREE concrete lifting price estimate in Traverse City. Leon, a retired teacher and Army reserve specialist, had one major requirement for whoever was going to perform work in his home: professionalism. Carbon Armor straps span the entire expanse of one of the walls. We can install Carbon Armor straps under and around existing fixtures without disturbing them. One of the hidden benefits of Carbon Armor straps over other reinforcement options is the ability to install them around basement fixtures with little disturbance. I am going to be finishing a bedroom in my basement and I need to install an egress window. The room is currently unfinished and there is a garden on the outside. Nothing fancy, just up to code. For now I'm looking at getting an estimate and a possible time line and go from there. Thank you! Snow melt water entering lower level of walk out basement. Intrusion at front corner of home. Drywall damage and wet carpet. Home inspection found cracks in foundation. Need estimate and time frame work can be done. Please text me ahead of your phone call. I work from home and appreciate the heads up so that I can pull myself out of what I'm working on before taking a call. Basement block wall is bowed. We have the house listed and had a structual engineer in to assess. We are being proactive to find a solution. We are in the process of purchases this home and it has water leeching from the walls. There are two sump pumps but it is not enough to remove the water. We are interested in an interior drainage system to help keep this crawl space dry. We have a crawl space and we would like to have a quote to have it sealed up a bit.